Dies R Us: Love Grows Here! It's almost time to finish up those Valentine cards you have been working on & I have one more idea to help you with a quick & simple one today. 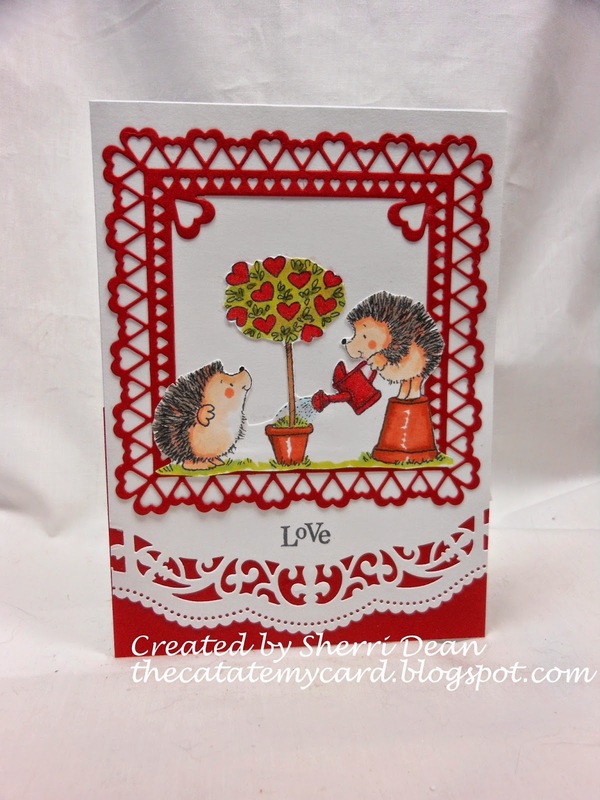 I'm sure you all have a favorite Valentine image (or sentiment) that you go back to again & again & for me, one of them is this Penny Black set of hedgehogs. I knew exactly which die I wanted them to go into too, but unfortunately, the image was just a hair bigger than the inside dimensions of my die. No problem! I just fussy cut the image out after I colored it & mounted it on top of my beautiful die. You can do this with any image or sentiment yourself & still create a beautiful card. The dies I used on this one were the Cheery Lynn Sweetheart Frame and Spellbinders Scalloped Borders Two. I think both of these should be must-haves for anyone who crafts! Remember to check out both of our Blogs! The daily inspiration blog (where you are at now) and the Dies R Us Challenge Blog that posts new challenges on the first & fifteenth of every month for a chance to win a gift certificate to the store! I don't know of any other company who carries as many different die companies as we do or has better shipping rates either! Check it out & don't forget to sign up for the newsletter so you won't miss out on special offers! Catch you back here next Wednesday with something I think you will love! Super cute Sherri! I have all of the borders by Spellbinders; imagine that, lol. Great design and your coloring is amazing.